1.1. David PICKERING pavior, born c1791, died before 1851, married Mary UNKNOWN born c1785 Beverley, died before 1861 Hull. 1.1.1. William PICKERING pavior, born c1811. 1.1.2. Ann PICKERING bonnet maker, born c1813 Sculcoates, Hull. 1.1.3. David PICKERING pavior, born c1816 Hull, married 16 February 1841 Hull Mary Ann CALVERT died before 1851, married 2nd 1 April 1852 Sculcoates, Hull Milcah Martin WARD (daughter of Captain Samuel WARD and Jane UNKNOWN) baptised 24 June 1821 Sculcoates, Hull. 1.1.4. Hannah PICKERING born c1818 Sculcoates, Hull. 1.1.5. John PICKERING pavior, baptised 5 Novembrer 1821 Sculcoates, Hull, married1840 Sculcoates, Hull Elizabeth WILLIAMS born c1810 and died before 1881. 1.1.3.1. Mary Ann PICKERING baptised 18 April 1841 Hull. 1.1.3.2. Eliza PICKERING baptised 30 April 1843 Drypool, Hull. 1.1.3.3. Sarah Jane PICKERING baptised 16 November 1845 Sculcoates, Hull. 1.1.3.4. Caroline Maria PICKERING baptised 21 June 1848 Sculcoates, Hull. 1.1.3.5. 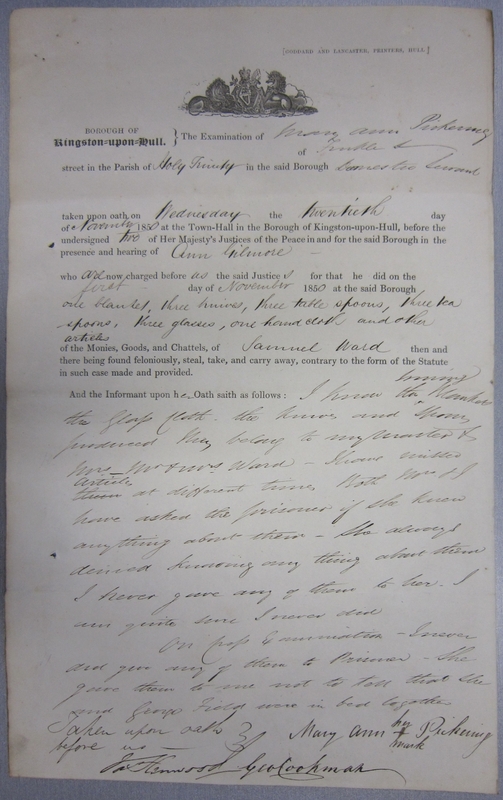 Samuel Ward PICKERING baptised 7 April 1853 Sculcoates, Hull. 1.1.3.6. Ellen Elizabeth PICKERING baptised 22 June 1855 Stockton. 1.1.3.7. David PICKERING born 1857 Stockton. 1.1.5.1. Henry PICKERING born 1842 Hull, married 1863 Stockton, Co. Durham Mary Ann CALVERT born 1845 Stockton, Co. Durham. 1.1.5.2. Mary PICKERING born 1844 Hull. 1.1.5.3. Elizabeth PICKERING born 1846 Hull. 1.1.5.1.1. John Thomas PICKERING born 1866 Stockton, Co. Durham. 1.1.5.1.2. George PICKERING born 1870 Stockton, Co. Durham.